After the debut album of Luke Hess here comes the luxurious remix ep. 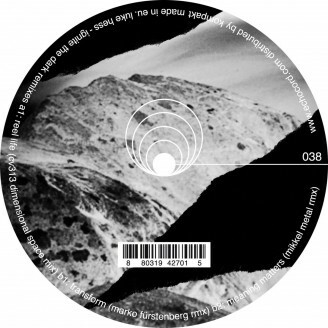 Its remixed by no one else than CV313 aka Stephen Hitchell from Echospace Detroit, Marko Fürstenberg and our own Mikkel Metal. The CV313 Rmx is a long upbuilding dubby, floating track with a lot of warm and deep sounds. For the fans of Intrusion and Echospace. The Marko Fürstenberg Rmx is a powerfull Dub-Techno track perfect for all dancefloors, quality dancemusic as we know it from Marko. Mikkel Metal again brings us his unique sound with this excellent remix, very funky grooves with deep dubby sounds. Luke Hess creates deep Detroit techno with a focus on soul and experimentation over prevalence and trends. Born in 1980 in metro-Detroit and subject to the city's mid-90's warehouse parties, Luke has harnessed a deep appreciation for the underground movement and electronic dance music. His faith based music production has given him the desire to reach out to others, in the hope that electronic music can be a bridge for restoration and not an avenue for destruction. After acclaimed releases on FXHE, and other successful releases on Beretta Grey, Echocord Colour, and Kontra-Musik, Luke's sound is beginning to take root. His Debut Album, "Light in the Dark" on Echocord further explores deep Detroit dance music through field recordings, live percussion sessions, analog experimentation, and dark cavernous melodies.